Students representing all the communities waiting to welcome the guests. 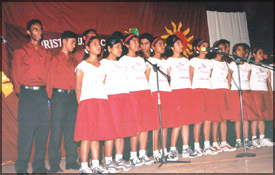 It was July 12, 2007, the dawn of a significant day for the principal, staff and students of Christ Church College, Matale, which is one of the oldest schools in Matale, established in 1864. It went down in history, as the first scouts troop was established here in 1912. 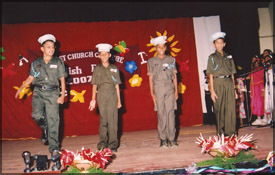 The venue for the much awaited event, the English Day was the Town Hall. 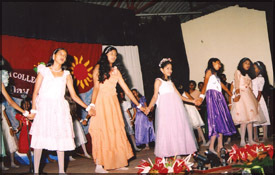 The students with their skilful performances added glamour to the event, a result of the collective effort of all the members of the English Unit under the able guidance of the Principal T. W. Mediwake. 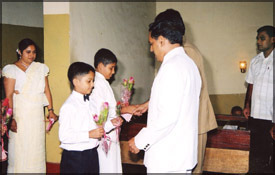 The Principal T. W. Mediwake and the Chief Guest, Mayor of Matale, Al Haj Hilmy Careem, being welcomed by two students. 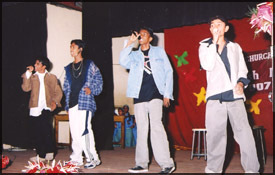 A song ‘All rise’ presented by Task team of Grade 13 (boys). Action song ‘My Bonnie’ presented by Grade 7 students. 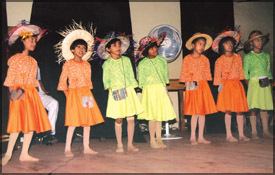 A scene from the action song ‘Aunty Monica’ by Grade 3 students. 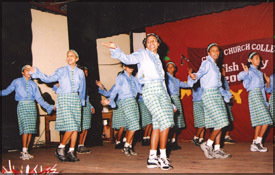 ‘Soldiers Marching’ - a scene from the action song, ‘Summer’s day’ by students of Grade 7. 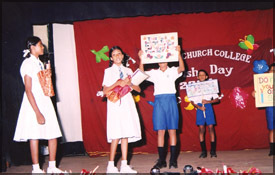 Advanced Level students presenting ‘Jimmy’. Scene from the dialogue ‘Use of public property’ by Grade 8. 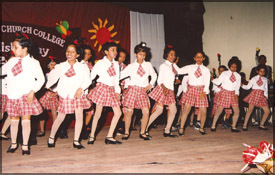 Grades 4 and 5 students dancing. 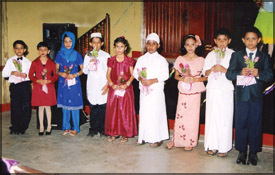 Assistant Director of Education (English) Matale, Wimal Wijesooriya was the guest of honour. Former Principal D. Pandigama, RESC staff, past pupils and representatives from neighbouring schools graced this occasion. The welcome address was delivered by the Subject Coordinator (English) M. Z. Mohamed Reza and the vote of thanks was given by senior prefect Srimali Padmasiri. 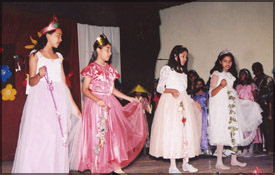 It was indeed a spectacular event, colourful and rich with artistic performances, dances and melodious voices. Featured here are some of the highlights of the event. - M. Z. Mohamed Reza.